Surely and steadily The Church of Jesus Christ of Latter-day Saints moves across the earth. In Daniel’s language it is “the stone … cut out of the mountain without hands.” 1 Isaiah described what he foresaw as “a marvellous work and a wonder.” It is a wonder! The Restoration of the gospel of Jesus Christ is filled with miracles, revelations, manifestations of every kind. Many of those have come in our lifetime. I was 17 years old before there was any stake of Zion anywhere outside North America. There are now well over 1,000 stakes on those distant continents and isles of the sea. We now have 125 temples operating or announced, more than half of which (64) are outside the United States. Again I was nearly 16 before there was even one temple beyond the states and provinces of the USA and Canada. We have lived to see the revelation extending the priesthood to all worthy males of appropriate age, a blessing which has accelerated the work in many parts of the world. We have lived to see the publication of our scriptures, wholly or in part, in nearly 100 languages. We have lived to see the long-awaited creation of the Quorums of the Seventy with great men drawn from many nations and, in turn, deployed to serve in many nations. Most recently President Hinckley has announced a Perpetual Education Fund that has the potential to bless many in even the most distant locations of the earth eventually. And so the internationalizing of the Church goes on. I give this brief summary to highlight another miracle, another revelation, if you will, that may have been overlooked by the general membership of the Church. In a way it was intended to be transparent to the public eye. I speak of the decision made by the Brethren just over a decade ago to cease placing any special assessments or other fund-raising obligations upon the members of the Church at home or abroad. Inasmuch as this decision was made amidst the very international growth I have just described, how could this be done financially? How could we go to more and more distant locations at the very moment we were removing all ancillary assessments from our people? Logic in the situation might have suggested exactly the opposite course of action. How was it done? 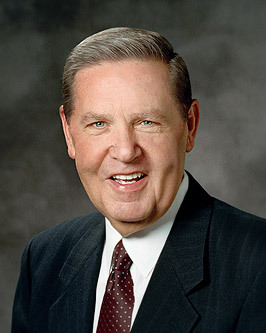 I will tell you how it was done—with the wholehearted belief on the part of the presiding Brethren that the Lord’s principles of tithing and freewill offerings would be honored by even the newest member of the Church and that loyalty to such divine principles would see us through. I was not in the Quorum of the Twelve when that momentous decision was made, but I can imagine the discussions that were held and the act of faith required within the presiding councils of the Church. What if the Brethren were to cease assessments and the Saints did not pay their tithes and offerings, what then? So far as I know, that thought was never seriously entertained. They went forward in faith—faith in God, faith in revealed principle, faith in us. They never looked back. That was a magnificent (if nearly unnoticed) day in the maturing of The Church of Jesus Christ of Latter-day Saints. But to honor that decision, we must be equally mature as individual members of the Church. May I then suggest five reasons why all of us, rich or poor, longtime member or newest convert, should faithfully pay our tithes and offerings. First, do so for the sake of your children and grandchildren, the rising generation, who could now, if we are not careful, grow up in the Church with absolutely no understanding as to how their temples, chapels, seminaries, and socials are provided. Teach your children that many of the blessings of the Church are available to them because you and they give tithes and offerings to the Church. Teach them that those blessings could come virtually no other way. Then take your children to tithing settlement with you, just as President Howard W. Hunter’s grandson was taken with his father several years ago. In that experience the bishop indicated his pleasure in young Brother Hunter’s wanting to pay a full tithing. In the process of receiving the coins, he asked the lad if he thought the gospel were true. As the boy handed over his full tithing of 14 cents, this seven-year-old said he guessed the gospel was true but “it sure costs a lot of money.” 3 Well, the buildings, programs, and materials I have mentioned do have an attached cost. That is not an unimportant lesson for our children to learn in their youth. I can’t list all the ways that blessings will come from obedience to this principle, but I testify many will come in spiritual ways that go well beyond economics. In my life, for example, I have seen God’s promise fulfilled that He would “rebuke the devourer for [my sake].” 6 That blessing of protection against evil has been poured out upon me and on my loved ones beyond any capacity I have to adequately acknowledge. But I believe that divine safety has come, at least in part, because of our determination, individually and as a family, to pay tithing. I testify that the principle of tithing is of God, taught to us in such scriptural simplicity that we cannot doubt its divinity. May we all claim its blessings forever, I pray in the name of Jesus Christ, amen.